Monster Cable Monster Rock Instrument Cable Angled-Angled 8 in. Voted the "Favorite Guitar Cable" in Guitar Magazine's 2009 Reader's Choice Awards, Monster Cable's Monster Rock Instrument cable has an advanced coaxial design that preserves fast transients, clean highs, and vivid harmonics while patented multiple gauge wire networks enhance your guitar's sonic bite. A solid core center conductor provides tighter bass response, plus an extra-dense braided shield and carbon-infused dielectric minimize interference and hum. 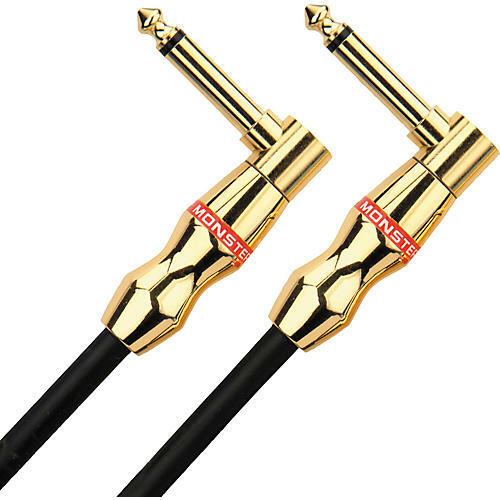 Monster's 24k gold-plated contact ergonomic connectors ensure a strong, reliable connection that withstands the constant abuse of stage and studio.